Square-Enix of Final Fantasy fame, has recently issued an announcement confirming the US release of Kingdom Hearts: Birth by Sleep. Birth by Sleep is the prequel to the PS2’s original Kingdom Hearts (a gem of a game that successfully merged the final fantasy mythos with Disney’s characters) story, revolving around 3 main characters; Terra, Ventus, and Aqua. An essential piece to the KINGDOM HEARTS series arrives on the PSP system: From world renowned creator and character designer Tetsuya Nomura comes the latest installment in the beloved KINGDOM HEARTS series. The vibrant and colorful KINGDOM HEARTS world comes to life through stunning graphics in 16:9 widescreen presentation, made possible by the PSP system hardware. 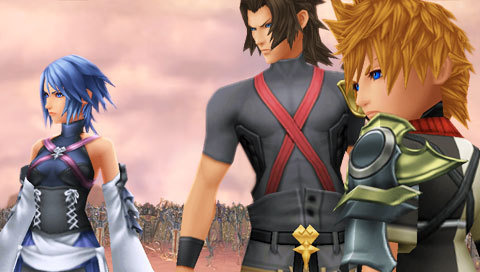 Three distinct gaming experiences through the eyes of three protagonists: Unravel the mystery surrounding the origin of the KINGDOM HEARTS saga through the tales of three unique characters – Terra, Ventus and Aqua. The whole story is revealed only after playing through with all three characters. An action-packed combat system with intuitive controls: The familiar action-packed experience that KINGDOM HEARTS fans have come to embrace returns with an enhanced battle system, with all new features such as Command Styles, Command Decks, Shotlocks and Dimension Links. KINGDOM HEARTS Birth by Sleep is the most advanced KINGDOM HEARTS title to date. Four exciting multiplayer modes: Share the excitement and fun with your friends with four brand-new multiplayer modes: Versus, Arena, Command Board and Rumble Racing. New game features: The North American release will include a number of new features including Crown Stickers, an extra boss and additional multiplayer options. 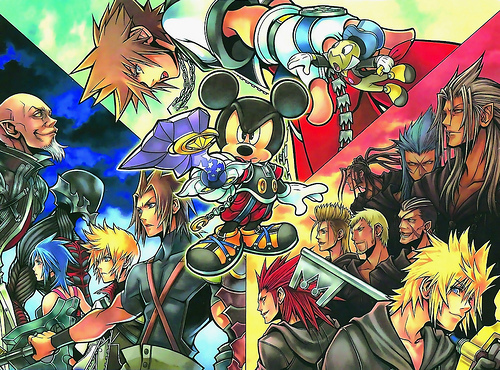 Kingdom Hearts: Birth by Sleep arrives in Summer 2010. Heh. Looks like I’m going to update my PSP Games to look forward to in 2010 post. Dante’s Inferno has already been released and Birth by Sleep (and Monster Hunter Portable 3rd) is confirmed and incoming. Anyone looking forward to this title in particular? tol, ask lang po. . . may lam k bang online game para s psp na hnd na kelangan ng psn? oh kaya mmorpg? salamat tol. Uhh.. any PSP game with adhoc multiplayer then connect to the web via xlinkai?